Halloween Spider Webs is integral to Halloween Decoration. Also perfectly fit for funny party, performance, masquerade, party games and bar to create a creepy atmosphere. 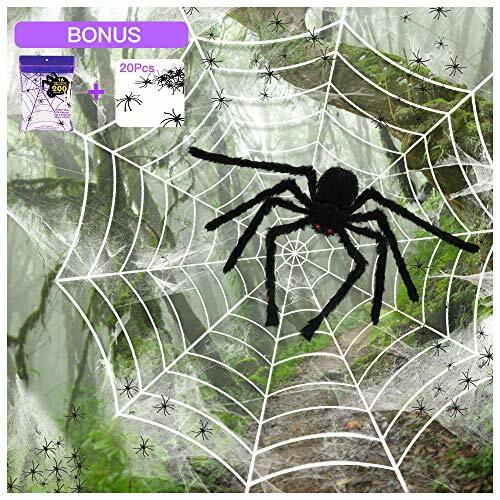 Specifications: - Items: Big Spider Web, Stretchy Cobweb, Little Plastic Spiders - Size: 16.4x15.7 feet, 20g(covers over 200 sq. Ft.), 4x4 cm - Material: Polyester, Artificial Cotton, Plastic - Color: White, White, Black - Weight: 0.6 lb (total) Note: It would be a great combination of giant spider web and large spider which is also sold in our Store. SO You Can't Miss it. Add them to Cart Now! 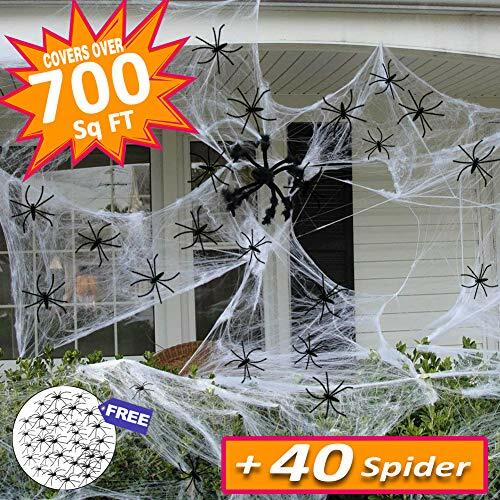 Package Includes: - 1 x 16 feet giant spider web - 22 x fake plastic spiders - 1 x stretchable cobweb - 5 x ground stakes - 1 x gutter hook Caution: Keep the spider web, cobweb and little spiders away from toddler and little children in case of choking or suffocation. 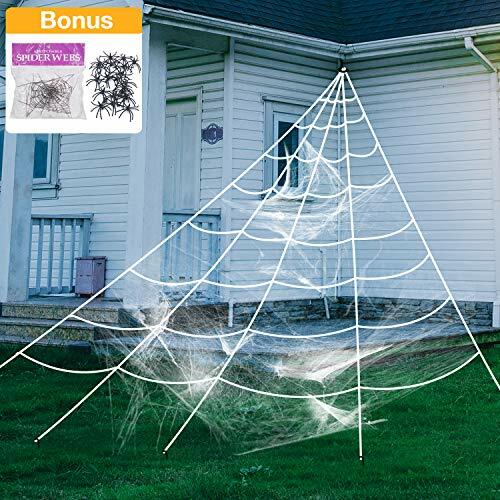 Transform you home to an abandoned haunted house instantly with our Big Pack Stretchable Polyester Spider Web. Perfect for a quick Halloween scene transformation for Halloween party or trick or treat events. 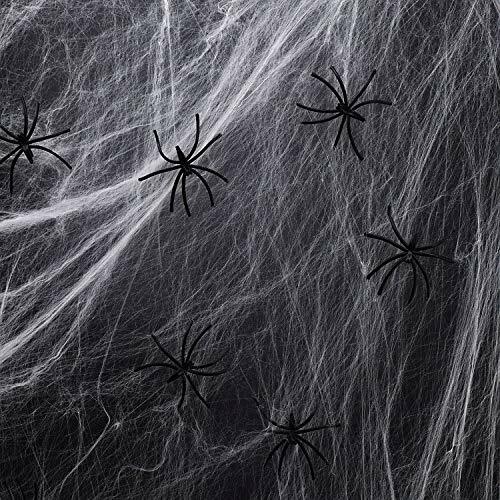 Add some extra fright to your night with our realistic spider web and spiders, a must-have Halloween props for your house and decoration to create Halloween spookiness! Features: Good quality artificial soft cotton make the web durable to use and adaptable with Halloween decoration. Super stretchable web to cover about 300 sq ft, very easy to cover windows, walls and furniture etc. Very easy to set up, just stretch the web and cover anywhere you want to decorate. 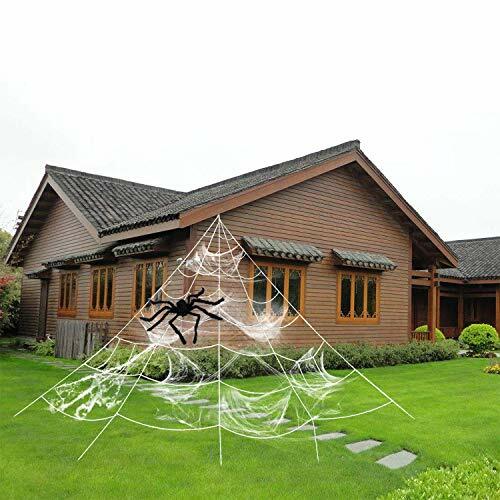 Extra 60pc fake spiders can enhance the Halloween atmosphere. Suitable for Halloween parties, carnival, haunted house and most special occasions. Specification: Web size(approx. 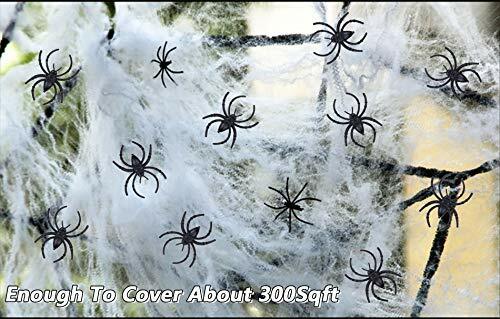 ): 300 sqft (Maximum stretch size) Fake spiders size(approx. 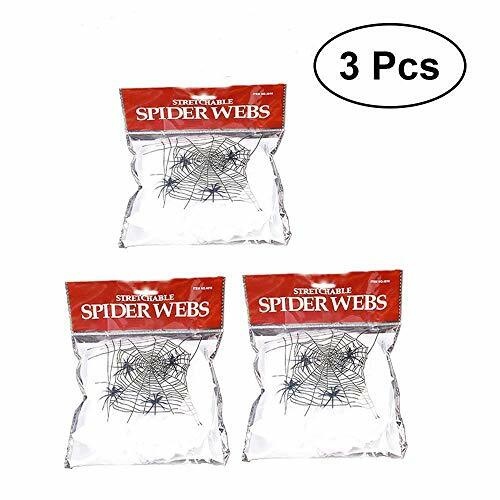 ): 4.5 x 3cm/1.78 x 1.19inch Color: White Spider Web & Black Spider Material: Stretchy artificial cotton web and plastic spider Package Includes: 1 x Fake Spider Web 60 x Plastic Spiders Notes: Keep the spider web, spider from toddler and little children in case of choking or suffocation. Keep the spider web and spider away from open fire. Warm tip: Dear Sir or Madam, if you have any questions before or after you buy our product , please don't hesitate to contact us, we will be very glad to help you, thanks for your support! 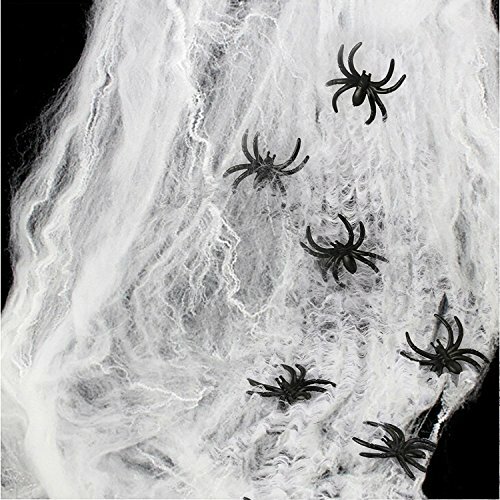 SILVIA Halloween spider pack of 4 is easy and funny decoration of creating a spooky places. Features: 1. 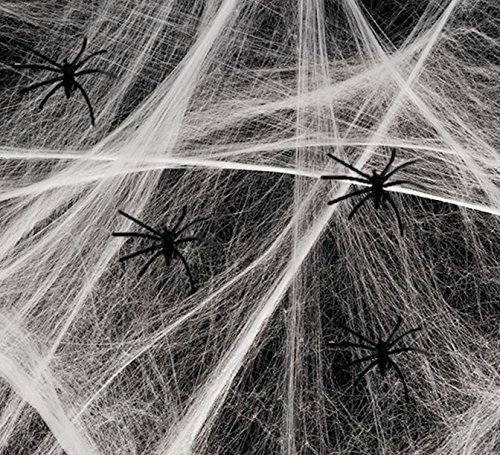 Terrifying, spooky and realistic looks of the component of the spider and webs produce dense Halloween atmosphere. 2. Easy installation of just tying up the ropes onto places, undrawing the spider on the web and stretching the cobweb to decorate, the ideal Halloween sight is done. 3. High quality workmanship. Strong polyester threads and hand-knotted joints make the web more sturdy and realistic. The spider is finely sewn and the legs are adjustable for various poses. 4. Many places to decorate. 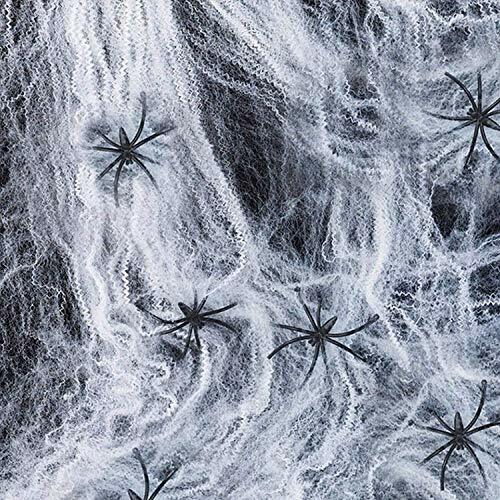 You may decorate your yard or other outdoor places Great Package Content: 1x 90cm/35" giant black spider 1x 11.8 ft white round spider web 1x spider cobweb which props 200 sqft 20x 1.96" plastic spiders Money Back Guarantee: Contact Seller and We Will Replace or Refund You If You are not Satisfied in 90 Days. 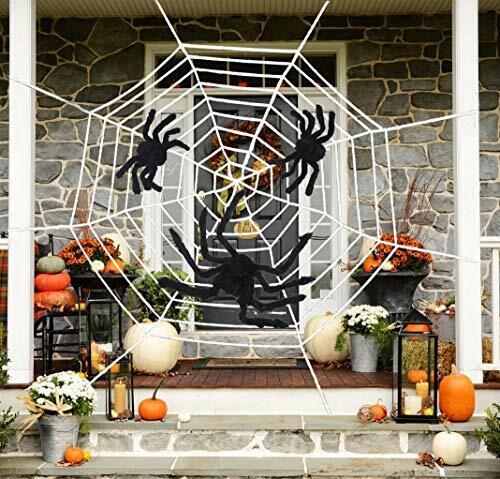 Go with our spider decorations and start your fun and unforgettable Halloween! 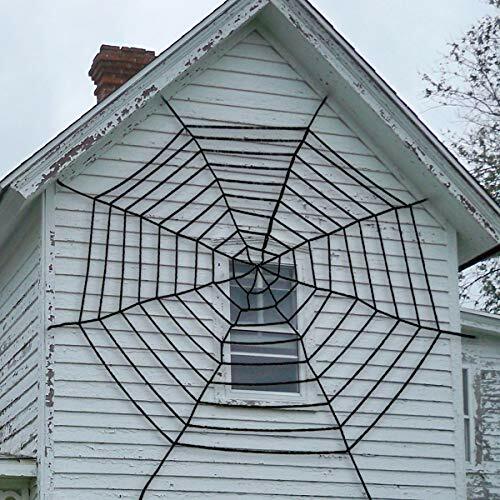 The simplest and most effective Halloween decoration --- Spider Web! 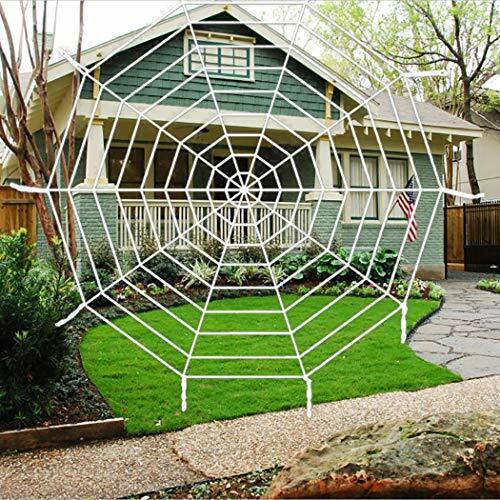 You can create a very realistic-looking spider web to cover a good area at your will. And the plenty of plastic spiders can be not only hooked to the web, but also put on open wounds, or any other place you want. 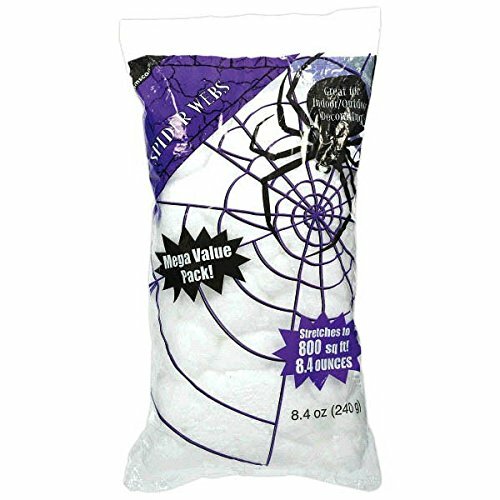 Specifications: White spider web: Made of artificial cotton, Weight: 60 g (can be stretched to cover approx. 200 square feet). Black fake spider: Made of plastic, Size: 4.5 x 4.5 cm (1.8 x 1.8 inch) Package includes: 1 x Stretchable spider web 30 x Fake spiders Note: Non-edible objects, be careful. Winding risk and choking hazard, keep them away from kids please. 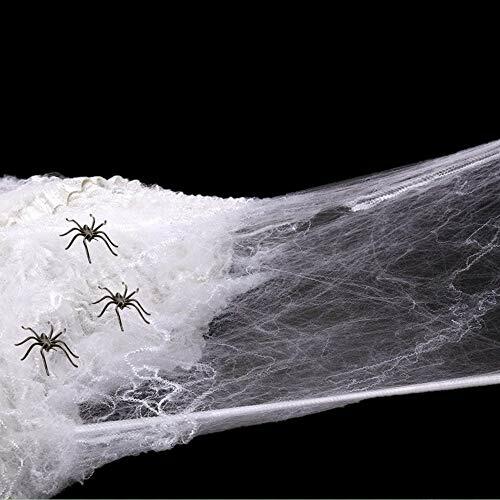 The coverage of stretchable spider web may be different, the more you pull it apart the more realistic it looks.